It’s never easy being a third-party app developer. Besides needing a great app idea, you must master your platform’s SDK, and then work hard to make sure your app has visibility in whatever platform ecosystem you’ve chosen to infiltrate. Enter Microsoft’s BizSpark program, which helps software devs bring their apps to market. One of the program’s major initiatives is Mobile Acceleration Week, a multi-city road show that’s designed to give guidance and support to Windows Phone Mango developers. Last week, the event was held in San Francisco, so we dropped by to hunt for the latest, greatest Windows Phone apps coming down the pike. Here are 10 of the most promising. Just be aware that not all are currently available in Marketplace. A self-proclaimed “next-generation news and aggregation service,” News360 looks at the content you visit on Facebook, Twitter, Google Reader and Evernote, and uses it to construct an “interest graph” that surfaces the news topics that should resonate with you the most. The app then uses all this data to create narrowly focused feeds that cater to your personal interests. 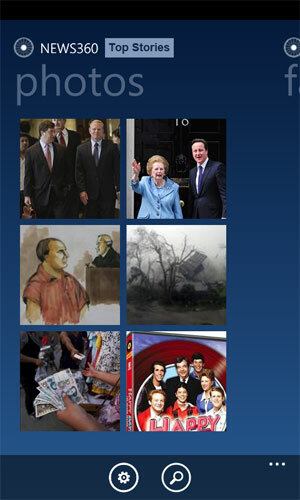 News360 was already available for all the major software platforms, including Windows Phone 7, and while the new app looks pretty similar to the WP7 version, it adds a number of Mango-specific features. In Mango, for example, users can pin not just an app, but a specific section of an app, as a live tile to their home screen. News360 adds this feature to its Mango iteration, allowing you to pin a category like “Breaking News” to the main screen of your Windows Phone. Other new News360 features include push notifications, and the ability to hook into global search. 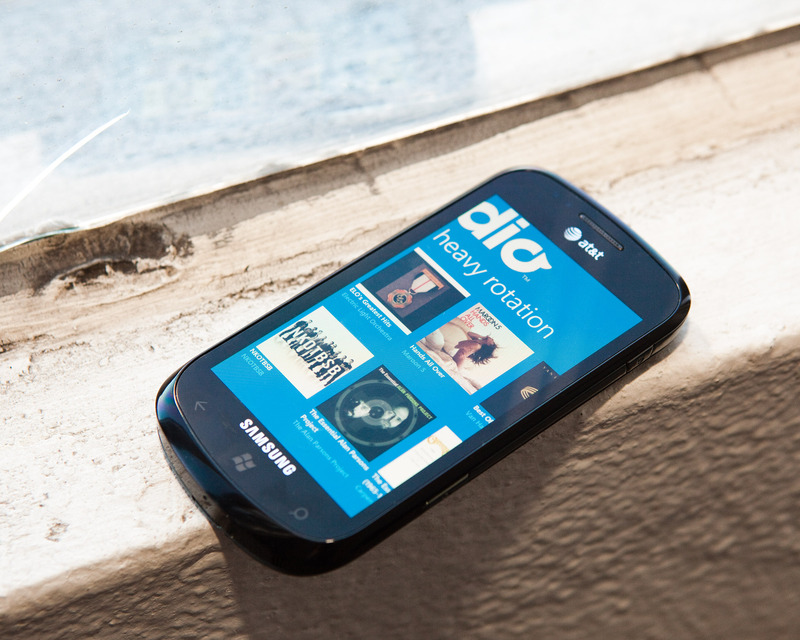 Stitcher is a free talk radio app that lets you listen to your favorite programs on demand. 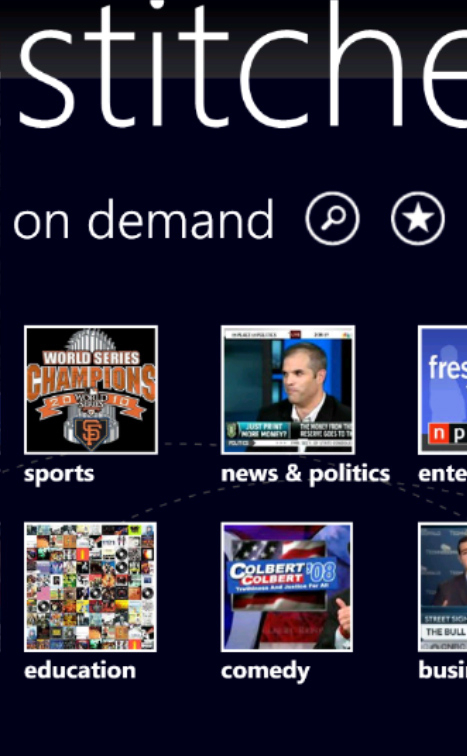 You can choose from more than 7,000 shows, and the app is available on all major phone platforms — including Windows Phone for the first time. The app’s name is derived from the practice of “stitching” together multiple stations and podcasts to create a personalized talk radio playlist. If you’re not quite sure what to listen to, or are looking to branch out to new sources, you can see what other listeners of the same show also liked. 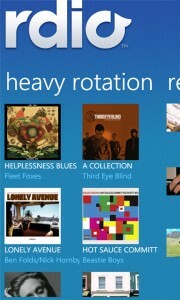 Rdio launched its Windows Phone 7 app last November, and now it’s revamped the app with Metro (Windows Phone’s signature user-interface style) and other Mango-specific features. Rdio is a social music subscription service — and for some, a favorite alternative to Spotify, which just debuted on the Windows Phone platform. In its big update for Mango, Rdio provides for offline support and background streaming on Windows Phone devices (something that couldn’t be done prior to the 7.5 update). 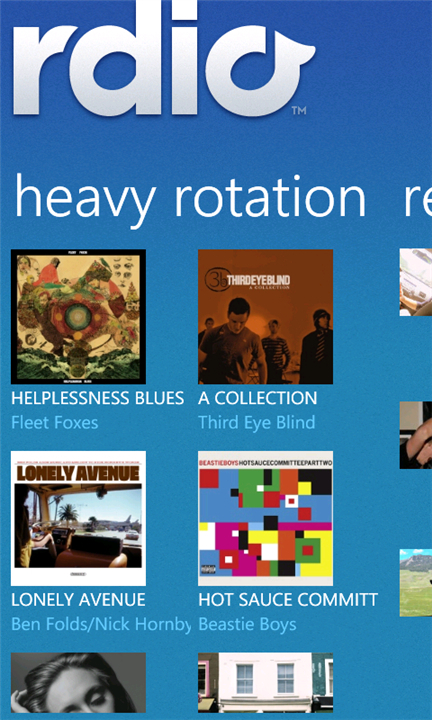 Rdio’s Windows Phone app now also includes Heavy Rotation (a feature that shows most popular tracks), a recent activity feed, and artist artwork in the background of the Now Playing screen (when available). To anyone familiar with the iOS version of the app, Rdio’s Windows Phone offering lacks a few features — the Recommended page, for example. But fear not, the developer plans to make all features available for all platforms, and the New Releases and Top Charts features should be added in the next version of the app. Skedi is a tool specifically designed for families. Its founder, John Buyer, had problems coordinating his schedule with his wife’s — she uses Exchange, he uses Google. Skedi addresses this disconnect by providing a unified calendar that combines all family members’ schedules in the cloud — and it does so regardless of whether everyone actually has the app on his or her mobile device. Once you sign up with SKEDI, you can send family members an invite to join your network. Each family member can choose his or her favorite calendar, and then that’s it. You can use the app to create an event, and if a scheduling conflict emerges (say, your wife can’t pick up little Timmy from soccer practice), the service sends you an e-mail and push notification so you’re aware of the change. Unlike Facebook events and other event schedulers, when you receive an invite, you can’t choose “maybe,” you can only accept or decline. Nonetheless, in addition to schedule management, the app is also helpful with resource management — for example, easing the confusion of sharing a family car. SKEDi recently made its debut in Apple’s App Store, and this week it launches as a Windows Phone app, too. 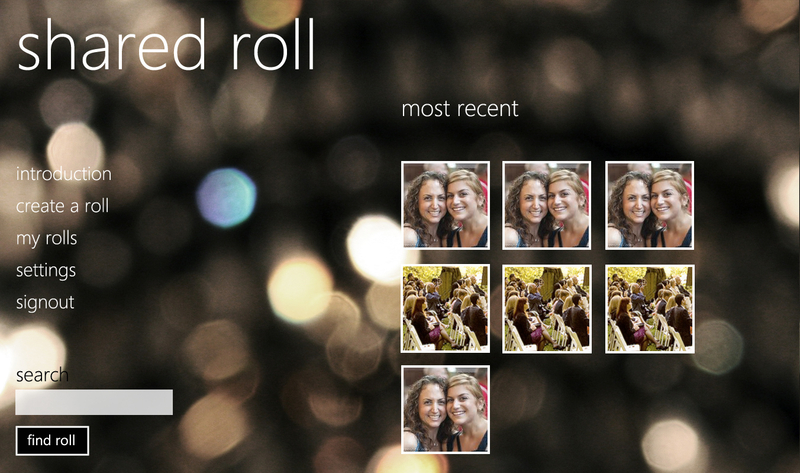 Shared Roll, from start-up Chute, provides a straightforward way to collect and share photos from a particular event. You can create a “roll” of photos shot at a party, wedding or similar shindig, then share it via e-mail, Facebook, or Twitter. Others can then contribute their photos to the roll to make it more fun and festive. Each roll has its own web page so it can easily be shared. The app initially launched on iOS, but will be coming to Android this week, and will be launching on Windows Phone very soon. “Working with our developers to build our initial prototype required a new lens on the world — different from the paradigms we’re used to on iOS and Android,” Shared Roll’s co-founder and user experience designer Greg Narain says. The Chute team used Mango’s Panorama View for landscape content, as well as a feature called Jump List that sorts rolls alphabetically so a user can quickly jump to the right spot. Shared Roll also uses Live Tiles, so notifications and new photos can be pushed to a tile on the home screen, as well as secondary tiles, so you can pin a favorite roll to your home screen, too. News Republic is a news aggregation platform for the globally minded. It sources more than 250 publications worldwide, curating content for your personal tastes, and drilling deep through websites for the keywords that matter the most. Unlike other news aggregators, News Republic doesn’t pull articles from RSS Feeds. Instead, it goes straight to the sources themselves (parsing through photos and videos, where applicable). The app’s developers are based in Bordeaux, France, and the app is truly global insomuch you can read content, and get content, in a number of different languages. When you open the app, you’re presented with a few different screens to swipe through, such as a list of macro subjects and an aggregated list of Top News. If you have a particular area you’re interested in, such as “Windows tablet,” for example, you could search for that phrase and then pin the search term to your subject screen to always receive articles relating to that specific topic. And if you really love that topic, you can also pin it to your home screen as a live tile.